If you saw my last post it had to do with the approach I took to making a floater type frame for Diane’s latest painting. I gave a definition and explained how it was made, here’s a link if you’d like to check it out. That must of been a premonition for my next commission because I was asked to replicate a frame for a client. They have three beautiful paintings by the same artist and only one of them was framed. These are stretched canvas on 1 1/2″ thick stretcher bars, the edges have been painted so they asked for a wider reveal (3/4″) than what was done on Diane’s frame. One of the paintings measures 40″ x 45″ and the other is 36″ x 72″. The frame itself is minimal, only 1/2″ thick x 2″ wide. For that size of a painting I knew the frame needed to be reinforced. Oh yes, the name VanDam Float was chosen because that’s the clients name! After making up a corner sample to show them, they gave me a deposit and we’re off and running. For the frame itself Basswood will be used and then 3/8″ Baltic Birch plywood will make up the “float” area and serve to reinforce the frame. I always enjoy the hand planing process, especially when it involves a board of this size. 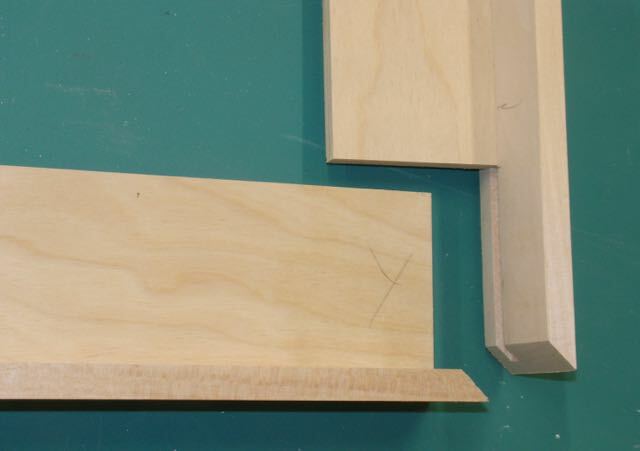 This project started with an 8/4 thick piece of Basswood that was about 6″ wide and 10′ long. Not having a power jointer of my own I’ll have the lumber yard sweeten one edge; aka straight line rip. Then it’s time to put the old Stanley #7 Jointer plane to work. Watching those shavings come through the throat always makes me feel good so thought I’d try to share it with you, probably should have had the camera a little further out there but you get the idea. Always reminded of hearing that in shops of old they would nail the longest continuos shaving to the wall and whoever made it could sign it — got one almost 6′ long from this board! Pretty straight forward process. After one edge was planed smooth and square the board was ripped to 2 1/4 width, this will make 3 pieces for the frame so the process was repeated to get the rest. One face was planed before to guide against the bandsaw fence for resawing the required 1/2″. After resawing off one piece the sawn edge of the board was planed again and then resawn until all 3 pieces were cut. These were run through the planer to a uniform thickness. Now that those were ready it was time to rip the plywood down to 3″ wide strips. Each of the boards have a 1/4″ x 1/4″ groove and the plywood has a corresponding tongue on one edge and end. After cutting the sides to the required length the plywood and sides were glued together. To reinforce this frame and give the 1/2″ sides strength here’s what I came up with. These joints are staggered around the frame, in other words the plywood goes to the miter on one end but is shy of the miter on the other. Although you can’t see it in the picture, the plywood on the bottom piece has a tongue cut into it that glues into the groove on the piece. The miter will be glued as well then have a few brads shot into to secure it while the glue dries. There is also a masonite gusset that will be glued and clamped on the back over the plywood splice. Lots of things going on at one time but by the end of the day, both frames have been assembled. The 72″ one had to have the plywood spliced since Baltic Birch generally comes in 5′ square sheets. This entry was posted in Picture Frames, YouTubeVideo and tagged floater picture frame, gusset, Miter joint, Stanley #7 Jointer Plane, tongue and groove joint. Bookmark the permalink.